what is the perfect skirt length and skirt type for women over 40? 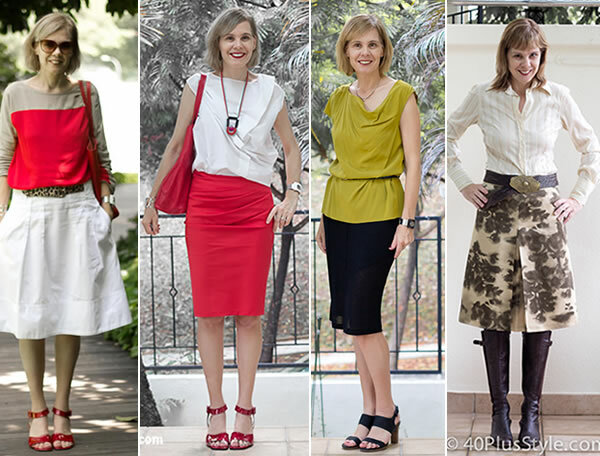 40+ Style » How to dress for your body type » What is the perfect skirt length and skirt type for women over 40? Let’s talk about skirts today. Getting the right skirt length, but also the right fit and shape, can make all the difference between looking fabulous or looking frumpy between young and hip or a bit old lady. What is the perfect skirt length for women over 40? One skirt length that will always be flattering for women over 40 is knee length. I now like my skirts best when they either finish at the top of the knee or just below. However, just above the knee is good too. What is so flattering about this look is that it shows of your full calve. It creates a slimming elongated look. Avoid getting skirts or dresses that end at the middle (and thickest) part of your calves. The 4 skirts picture above are all either top, middle or just under the knee. As always, this is just a guideline and certainly not a ‘rule’ set in stone. I still wear my black skirt seen here which is a lot shorter and also my animal print dress which is a lot longer and I wear a mini dress on a summer holiday to the beach. See a few examples below of considered ‘imperfect’ lengths for my age. I think I can get away with most of these looks. Partly due to the styling and partly due to the type of skirt and how well it fits me. When you buy a skirt in these more challenging lengths, do have a critical eye and look in the mirror. If you are short, you may actually prefer slightly shorter lengths.Test out several lengths and see what works best for your body and your personality. Then ask yourself these questions: Does it look good on me? Is the skirt length too aging or unflattering? Does it make me look too young? Trust your own instinct! However, if you want to play it safe then you can never go wrong with knee length skirts. I’m personally aiming for my new skirts and dresses to be exactly knee length, but every now and then I will break that personal rule as the examples above testify. Especially when I see a nice asymmetric cut like my silk red dress. What type of skirt is best? The type of skirt that is best for you depends on your body type. However, I can offer some general guidelines. You will look more sloppy in skirts that are too wide. It’s nice to fit your skirts around your hips and then have a slight A-line or bias cut, rather than having a skirt that is wide all round. I’m a big fan of that the A-line skirt as I showed you in this black and white outfit and this A-line wide pleads skirt. I find that these slight A-line skirts look the most flattering on me. They are very flattering for many women, especially if you have wider hips, bigger legs or wider shoulders as they balance you out. Straight skirts are considered a more hip option by many. I personally find them harder to wear because I find them less comfortable and often too body-conscious, but if you are comfortable in those areas, they can be very flattering on many women over 40. Another skirt that looks good on many women is the trumpet skirt. Fitted at the hips and a flare at the bottom. And, of course, you all know that I’m a big fan of an asymetric skirt like this blue one. This skirt is not really trendy, but more unusual and will never really go out of style. Pleated skirt: This will look best when the pleats do not start at the waist. Be careful with small pleated skirts though as they can age you. Denim skirt: Can look good but be sure to dress them up a bit. Best not to wear them too short and knee length is best. Balloon skirts: great for people like me who are relatively straight and have a flat bum. This skirt will give you more shape. Peasant skirt: needs to be worn with care. Make sure it’s not too wide and too long. Full skirt: A trickier look to wear for women over 40. I still like my silk pink skirt which is at a perfect length. It’s usually best to wear with a tight top but can also look really nice with a blazer with a hip belt around your waist. Or take inspiration from Thomas Wee’s collection who also showed a few great full skirt options (as well as some great straight skirts!). Long skirt: can look nice but may also overwhelm you. In general it’s nicer to show a little leg over 40. Whether or not a skirt looks good on you or ages you, is all about the fit. I remember an episode of “How do I look”, where a woman was asked to rate 5 outfits in terms of how expensive they were. She got them all wrong. What she had scored as the most expensive outfit was actually the cheapest. And the only reason she had rated that outfit as the most expensive, was because it fit the model perfectly (the most expensive outfits were not fitted that well). If something fits you well, it not only looks good, it also looks more expensive and will give you more of a young and hip look. So fit in any garment is hugely important. Of course, as mentioned before, pay close attention to your body type to decide which type of skirt is best for you. When you read the above guidelines and discover some skirts in your wardrobe that just don’t suit your body or don’t fit well, you may be able to take them to a tailor. They can turn A-line skirts into straight ones, lift your waistline or make your really wide skirt more fitted. Please remember, these are just guidelines that will hopefully be of help to you and help you create a young and hip look after 40! Apply them when needed but don’t be afraid to experiment and bend the guidelines whenever it suits you. Trust your own instincts! Another important factor whether or not your skirt will work or not is to create the right balance within the outfit and apply the rule of thirds. We will discuss that in more detail and lots more in the 40+ Style Course! What type of skirt and skirt length do you prefer to wear? Wow what a fabulous article, Sylvia. I will take time to study them all and get back to you later, but in the meantime, nobody wears a skirt like you!!! You look amazing. Thanks so much for your help with this challenging item of clothing. I think lots of us are grateful for your help. I can’t wait to hear what everyone else says. Thanks Aileen. I look forward to your further feedback. Very thorough article. As a petite I like right at top of my knee the best, That is not to say i don’t wear anything else as I do have some that are slightly longer (bottom of knee) and then again in the spring I do a more bohemian ankle length as well. I feel there is that in between midi length that just doesn’t cut it for me. Those are ones that go to the middle of the calf. I must add that i can wear knee lengths or full lengths with ballet flats but for the ones that hit at the bottom of my knee, I prefer a wedge or a heel. Great feedback Tracey. I plan to write an article on the best heels to wear in the coming weeks as well.. I think that it depends on the women, I usually don’t wear mini skirt anymore because I have a few sins to cover! However my friend Luz is 63 years still wears mini skirts all the time because she has Tina Turner like legs! Yes, that is why these are just guidelines. Everyone is different and you will always have to look at what’s best for you. That is a great thing to know Rita. It’s definitely very wise to do a sit test before you buy anything. For me that’s very important with tighter jeans and trousers as well. My seamstress gave me that advice as well! I have a very pretty skirt that I have to adjust all the time when I am sitting down. So tirering. Remember when all skirts/dresses were all one length for a season? Thanks God that is over! Now we have so many choices! and I wear them all but my fave is an “a-line” mini. I know! It’s so nice that we have so many choices these days. Even though there are trends, you can still do pretty much anything that you like. Glad you appreciate this article Paula. You are a great example of a 50+er than can still rock the mini skirts! I love to experiment! So many skirt designs and lengths to choose from, which broadens the possibilities. The Derek Lam skirt is extraordinary! It’s fun to play for sure. Yes, that Derek Lam skirt is my favorite! I dislike my knees, so would always choose a skirt that comes to just below them, although I might go a little shorter if it was something I could wear with opaque tights. I love the Olivia Moon skirt you showed. Yes that is one reason I prefer my skirts either on top of my knees or just over. Great article with really good points. Kate Spade and Tory Burch always seem to have attractive skirts in their lines. Funny story of a dimwit (me). He agreed. Obviously neither of us played tennis ever in our life. I have to say that it dawned on me an hour later. Those upside down pockets are actually totally useless and most designers (rightly) don’t bother with them. Basically I always put the second ball underneath one of the pipes of the skort. Much quicker and handier! Only you Greetje, only you. 🙂 I actually have never bought a tennis skirt with an upside down pocket. I don’t think I’ve ever even seen one. I will have to ask the buyer at our club if she has seen them in the sportswear shows. You are very correct in how to style the wider skirts. In the end I think many skirts can look fabulous, depending on how they are styled. I still love wearing my miniskirts for tennis! Good article and great selection of skirts. I have found myself wearing only pencil skirts which come to the bottom of my knee recently. I have three longer ones but I am not sure if they look frumpy. Need to try them on again. Marie S.
I love dresses and skirts. My length usually is right at or above the knee. Slightly shorter skirts I wear with black opaque tights or tanned legs in summer. I do prefer a straight or an A-line but I am very reluctant to full or pleated skirts because I feel they easily look girly if they are too short and frumpy if they cover the knee. Shoes are so important and I chose heels most of the time. In summer I love ballerinas as well. Looking forward to your future post on heels! Yes, I forgot to mention that. But I would wear shorter skirts and dresses in winter without any issue, if they are paired with thick tights and boots. I actually think that can be a great look! Very good article. Thanks for all your work. I wear them exactly the same as you do. Although I never have them shorter anymore, not even in summer, but I am much older than you are. When I saw all those skirts it was as if you were showing them haha. I very much like the polka dot pencil skirt, which is even cheap. Thanks Greetje. Glad you enjoyed the article and yes that polka dot skirt is very nice! Lol! Now I see why you seemed a little concerned about my mini skirt. I don’t think I’ll be able to wear minis with bare legs much longer, so ill be enjoying them as long as possible! But I live in an unusual place. Los Angeles is very “anything goes” in terms of personal style and fashion. For me, after spending my 30’s worried about looking “appropriate” I’m really over it. And as much as I like knee length skirts, and agree with you that they are very flattering, I’m just ready for something else at the moment. P.s. I love that red skirt with the stirring around the waist! Skirt lengths are important. Not only as 40-somethings but at any age really. My own opinion is that it depends on what shape your legs are, and in what condition they are in 🙂 And getting the style of the top to match can be harder than you think. I think you get it spot-on Sylvia, and generally just sitting on the knee is perfect (for any age)! How do you feel about the long cotton skirts with stripes? I have one that I wear, I am only 5’2″ but people always seem to compliment me when I wear it! I tend to wear it with a little jean jacket! Yes they are very hip right now. Wear with small booties for a very trendy look! I recently had some ankle length skirts made for me. I only ever seem to see longer skirts with elasticated waists so had them made with a fitted waist, with a proper zip on the back. They have a nice flare to them too, very feminine. Also when I say ankle I don’t mean maxi as so many people seem to. At 5’7″ a bit of leg showing below the hemline looks so much better than floor grazing maxis. Great. Thanks for your feedback Veronica! Great article, I wear skirts most of the time and love it. I love the girly feeling. Today in CO it turned cold. I just moved here from the FL and trying to figure how to dress here. Seems the weather dictates the style of skirt to wear. Not a fan of a flared skirt due to settleing in the thighs. This article is getting me off to a great start. Love to sew and like dressed up to date when I walk out the door, even to Walmart. Thanks for the feedback Barb. Great to hear that this article helped you! Why can’t women over 40 wear long or peasant skirts? What about LONG dresses? Are they a possibility? Remember the movie “The Stepford Wives” from 1975 (not the awful 2004 version)? If I am not mistaken, many of the women (the wives) in that movie are over 35 or in their early 40’s (I looked up their ages at the time of filming that movie). I LOVE the long dresses that they wear…sophisticated but not too ‘precious’ in my opinion. I realized that is just a movie (and that was a different era), but why can’t women over 35 or over 40 wear long skirts and dresses in your opinion? I know we all have our own style and our own taste. I love vintage and I love to sew, so I want to incorporate what I love into what I wear. I realize that I cannot wear too-revealing or too ‘precious’ styles at my age, but I still want to have FUN. The examples that you have shown us are all very fine and acceptable, but a little boring in my opinion. I am in my early 40’s and wear my hair long which actually flatters me more than a short hairstyle would because my face is kind of rounded (though I am small-boned and have a long neck). I look young for my age. I don’t want to ‘compete’ with younger women for attention as I am happily married for nearly 14 years now, but I don’t want to dress too frumpy, either. I am not really into jewelry and accessories. As I said, I love to SEW and I love fabric, and frankly these over 40 suggestions are not thrilling to me. I realize these are general rules, but a person’s overall appearance, hairstyle, weight, and body type should be taken into account in addition to age when determining what is age appropriate and what is not. I agree with you, but these guidelines are for women that like some direction and should not be read as ‘must do’. I absolutely think long skirts and peasant skirts can look wonderful. I always encourage everyone to find ‘their style’ and see what makes them happy. The main thing is that you have fun with fashion and that you are happy with the way you look. My google search about whether or not a woman over 40 can wear long skirts and maxi dresses led me to your blog. I just wanted to comment…I probably jumped the gun but I couldn’t help myself. As I mentioned, I often face the dilemma of what will work and what doesn’t work any more. My husband is my toughest critic (but he is kind). He definitely does not want me to dress too frumpy but he will let me know if something looks too young for me. Another good way to gauge things is by what other people have to say…and by what their reaction is. I would be wary about what other people say or how they react. There are a lot of reasons why people react how they do – it could be they are not used to seeing you dress in a particular way, they could be jealous, they have preconceptions about how somebody ought to dress, they think you are drawing attention to yourself, it’s not what they consider age appropriate or they could be saying what they think you want to hear, etc etc. Even husbands are not reliable critics (although if they refuse to leave the house with you it’s quite a good indicator!). If you stay on this blog long enough you will see most of us are in the same boat! I came to this site because I was looking for guidance on capri pants. I now realise they are probably not the best thing for me to wear for my body shape but I love them and still wear them – but not the leg-flapping variety. In short, we are learning about our bodies and what suits us, how to interpret trends so we can look up-to-date, and most of all, how to have fun with fashion! Good luck! I have never liked the just-above-the-knee, at-the-knee, or just-below-the-knee skirt lengths; they just don’t work for me. I do, however, love lower-calf-length, ankle-length, and, through my late twenties, mini-length and mid-thigh-length skirts. I think your choice of length should compliment your body-type and reflect your personality. Next post: What is a hair spa and how does it work?